Even when packing light, I always include a few “insurance” items in case of emergency. 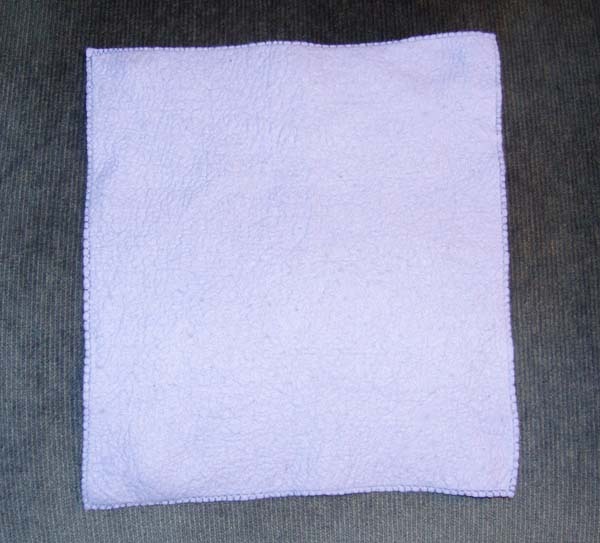 One of those is a 9×8-inch washcloth made from synthetic chamois fabric, the kind advertized for car detailing. I first got the idea when the fabric was sold as a backpacking towel. Being lightweight and super-absorbent were the towel’s selling points for hiking and camping trips. I pack this chamois-style washcloth on all my trips. 1. It provides me with my own personal washcloth whenever a hotel or host home doesn’t offer one. If this hasn’t happened to you yet, don’t be too sure it never will. About 15 years ago, at a well-rated hotel in rural southwest India, my daughter and I were issued one bath towel and one hand towel to share. That was all we got for bath linens. I sure could have used my own washcloth on that trip. 2. When en route, the cloth works great as additional padding next to my 2-sided makeup mirror. 3. Need to touch up delicate fabric with the hotel’s iron? The “shammy” can be used as a lint-free pressing cloth. 4. When you’re stuck in an airport or bus station during long travel delays, the washcloth allows for better personal hygiene than is possible with paper towels—assuming paper towels are even offered, now that high-powered hand dryers are so prevalent. 5. If an emergency happens where you quickly need a lot of absorption for any type of body fluid, you’ll appreciate the washcloth’s super-absorbent quality. 6. The super-absorbency also helps when you hand-wash socks, tank tops, or other items in hotel sinks. Just roll up each piece of clothing in the washcloth and squeeze to remove excess water before hanging your laundry to dry. 7. If you need a clean space to lay something on—such as when applying cosmetics or consuming a snack in an unusual location—you can spread out the washcloth as a little placemat. When done, simply shake crumbs into trash receptacle. Sauce, beverage, or toiletry spills can be rinsed out in a sink, and then the cloth can be popped into a zip-top bag until you have a chance to let it air dry. This entry was posted in Pennywise Packing Pointers and tagged airports, carryon, creative solutions, flying, laundry, luggage, packing, towel, washing. Bookmark the permalink.